People in the UK spend their leisure time in many different ways. A lot of people have gardens at home and will spend their free time looking after them. Some people rent additional land called ‘an allotment’, where they grow fruit and vegetables. Gardening and flower shows range from major national exhibitions to small local events. Many towns have garden centres selling plants and gardening equipment. 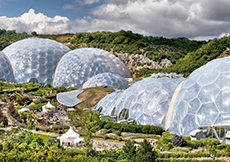 There are famous gardens to visit throughout the UK, including Kew Gardens, Sissinghurst and Hidcote in England, Crathes Castle and Inveraray Castle in Scotland, Bodnant Garden in Wales, and Mount Stewart in Northern Ireland. There are many different places to go shopping in the UK. Most towns and cities have a central shopping area, which is called the town centre. Undercover shopping centres are also common – these might be in town centres or on the outskirts of a town or city. Most shops in the UK are open seven days a week, although trading hours on Sundays and public holidays are generally reduced. Many towns also have markets on one or more days a week, where stallholders sell a variety of goods. Many people in the UK enjoy cooking. They often invite each other to their homes for dinner. A wide variety of food is eaten in the UK because of the country’s rich cultural heritage and diverse population. England: Roast beef, which is served with potatoes, vegetables, Yorkshire puddings (batter that is baked in the oven) and other accompaniments. Fish and chips are also popular. Scotland: Welsh cakes – a traditional Welsh snack made from flour, dried fruits and spices, and served either hot or cold. Wales: Haggis – a sheep’s stomach stuffed with offal, suet, onions and oatmeal. Northern Ireland: Ulster fry – a fried meal with bacon, eggs, sausage, black pudding, white pudding, tomatoes, mushrooms, soda bread and potato bread. The UK has had a major influence on modern cinema. Films were first shown publicly in the UK in 1896 and film screenings very quickly became popular. From the beginning, film makers became famous for clever special effects and this continues to be an area of British expertise. From the early days of the cinema, British actors have worked in both the UK and USA. Sir Charles (Charlie) Chaplin became famous in silent movies for his tramp character and was one of many British actors to make a career in Hollywood. British studios flourished in the 1930s. Eminent directors included Sir Alexander Korda and Sir Alfred Hitchcock, who later left for Hollywood and remained an important film director until his death in 1980. During the Second World War, British movies (for example, In Which We Serve) played an important part in boosting morale. Later, British directors including Sir David Lean and Ridley Scott found great success both in the UK and internationally. The 1950s and 1960s were a high point for British comedies, including Passport to Pimlico, The Ladykillers and, later, the Carry On films. Many of the films now produced in the UK are made by foreign companies, using British expertise. Some of the most commercially successful films of all time, including the two highest-grossing film franchises (Harry Potter and James Bond), have been produced in the UK. Ealing Studios has a claim to being the oldest continuously working film studio facility in the world. Britain continues to be particularly strong in special effects and animation. One example is the work of Nick Park, who has won four Oscars for his animated films, including three for films featuring Wallace and Gromit. Actors such as Sir Lawrence Olivier, David Niven, Sir Rex Harrison and Richard Burton starred in a wide variety of popular films. British actors continue to be popular and continue to win awards throughout the world. Recent British actors to have won Oscars include Colin Firth, Sir Anthony Hopkins, Dame Judi Dench, Kate Winslet and Tilda Swinton. The annual British Academy Film Awards, hosted by the British Academy of Film and Television Arts (BAFTA), are the British equivalent of the Oscars. The traditions of comedy and satire, and the ability to laugh at ourselves, are an important part of the UK character. Medieval kings and rich nobles had jesters who told jokes and made fun of people in the Court. Later, Shakespeare included comic characters in his plays. In the 18th century, political cartoons attacking prominent politicians – and, sometimes, the monarch or other members of the Royal Family – became increasingly popular. In the 19th century, satirical magazines began to be published. The most famous was Punch, which was published for the first time in the 1840s. Today, political cartoons continue to be published in newspapers, and magazines such as Private Eye continue the tradition of satire. Comedians were a popular feature of British music hall, a form of variety theatre which was very common until television became the leading form of entertainment in the UK. Some of the people who had performed in the music halls in the 1940s and 1950s, such as Morecambe and Wise, became stars of television. Television comedy developed its own style. Situation comedies, or sitcoms, which often look at family life and relationships in the workplace, remain popular. Satire has also continued to be important, with shows like That Was The Week That Was in the 1960s and Spitting Image in the 1980s and 1990s. In 1969, Monty Python’s Flying Circus introduced a new type of progressive comedy. Stand-up comedy, where a solo comedian talks to a live audience, has become popular again in recent years. Many different television (TV) channels are available in the UK. Some are free to watch and others require a paid subscription. British television shows a wide variety of programmes. Popular programmes include regular soap operas such as Coronation Street and EastEnders. In Scotland, some Scotland-specific programmes are shown and there is also a channel with programmes in the Gaelic language. There is a Welsh-language channel in Wales. There are also programmes specific to Northern Ireland and some programmes broadcast in Irish Gaelic. Everyone in the UK with a TV, computer or other medium which can be used for watching TV must have a television licence. One licence covers all of the equipment in one home, except when people rent different rooms in a shared house and each has a separate tenancy agreement – those people must each buy a separate licence. People over 75 can apply for a free TV licence and blind people can get a 50% discount. You will receive a fine of up to £1,000 if you watch TV but do not have a TV licence. The money from TV licences is used to pay for the British Broadcasting Corporation (BBC). This is a British public service broadcaster providing television and radio programmes. The BBC is the largest broadcaster in the world. It is the only wholly state-funded media organisation that is independent of government. Other UK channels are primarily funded through advertisements and subscriptions. There are also many different radio stations in the UK. Some broadcast nationally and others in certain cities or regions. There are radio stations that play certain types of music and some broadcast in regional languages such as Welsh or Gaelic. Like television, BBC radio stations are funded by TV licences and other radio stations are funded through advertisements. Social networking websites such as Facebook and Twitter are a popular way for people to stay in touch with friends, organise social events, and share photos, videos and opinions. Many people use social networking on their mobile phones when out and about. Public houses (pubs) are an important part of the UK social culture. Many people enjoy meeting friends in the pub. Most communities will have a ‘local’ pub that is a natural focal point for social activities. Pub quizzes are popular. Pool and darts are traditional pub games. To buy alcohol in a pub or night club you must be 18 or over, but people under that age may be allowed in some pubs with an adult. When they are 16, people can drink wine or beer with a meal in a hotel or restaurant (including eating areas in pubs) as long as they are with someone over 18. Pubs are usually open during the day from 11.00 am (12 noon on Sundays). Night clubs with dancing and music usually open and close later than pubs. The licensee decides the hours that the pub or night club is open. In the UK, people often enjoy a gamble on sports or other events. There are also casinos in many places. You have to be 18 to go into betting shops or gambling clubs. There is a National Lottery for which draws are made every week. You can enter by buying a ticket or a scratch card. People under 16 are not allowed to participate in the National Lottery. A lot of people in the UK have pets such as cats or dogs. They might have them for company or because they enjoy looking after them. It is against the law to treat a pet cruelly or to neglect it. All dogs in public places must wear a collar showing the name and address of the owner. The owner is responsible for keeping the dog under control and for cleaning up after the animal in a public place. Vaccinations and medical treatment for animals are available from veterinary surgeons (vets). There are charities which may help people who cannot afford to pay a vet. The UK has a large network of public footpaths in the countryside. There are also many opportunities for mountain biking, mountaineering and hill walking. There are 15 national parks in England, Wales and Scotland. They are areas of protected countryside that everyone can visit, and where people live, work and look after the landscape. There are many museums in the UK, which range from small community museums to large national and civic collections. 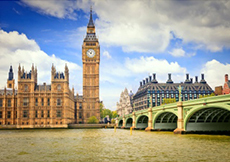 Famous landmarks exist in towns, cities and the countryside throughout the UK. Most of them are open to the public to view (generally for a charge). Many parts of the countryside and places of interest are kept open by the National Trust in England, Wales and Northern Ireland and the National Trust for Scotland. Both are charities that work to preserve important buildings, coastline and countryside in the UK. The National Trust was founded in 1895 by three volunteers. There are now more than 61,000 volunteers helping to keep the organisation running. Big Ben is the nickname for the great bell of the clock at the Houses of Parliament in London. Many people call the clock Big Ben as well. The clock is over 150 years old and is a popular tourist attraction. The clock tower is named ‘Elizabeth Tower’ in honour of Queen Elizabeth II’s Diamond Jubilee in 2012. 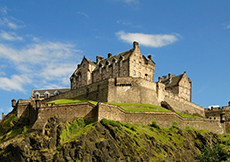 The Castle is a dominant feature of the skyline in Edinburgh, Scotland. It has a long history, dating back to the early Middle Ages. It is looked after by Historic Scotland, a Scottish government agency. 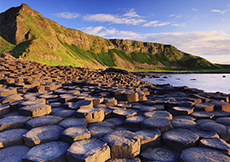 Located on the north-east coast of Northern Ireland, the Giant’s Causeway is a land formation of columns made from volcanic lava. It was formed about 50 million years ago. There are many legends about the Causeway and how it was formed. This national park covers 720 square miles (1,865 square kilometres) in the west of Scotland. 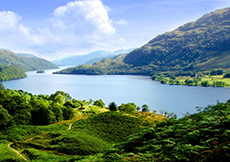 Loch Lomond is the largest expanse of fresh water in mainland Britain and probably the best-known part of the park. 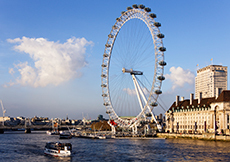 The London Eye is situated on the southern bank of the River Thames and is a Ferris wheel that is 443 feet (135 metres) tall. It was originally built as part of the UK’s celebration of the new millennium and continues to be an important part of New Year celebrations. Snowdonia is a national park in North Wales. It covers an area of 838 square miles (2,170 square kilometres). 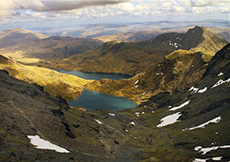 Its most well-known landmark is Snowdon, which is the highest mountain in Wales. 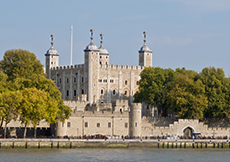 The Tower of London was first built by William the Conqueror after he became king in 1066. Tours are given by the Yeoman Warders, also known as Beefeaters, who tell visitors about the building’s history. People can also see the Crown Jewels there. 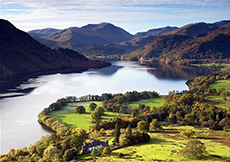 The Lake District is England’s largest national park. It covers 885 square miles (2,292 square kilometres). It is famous for its lakes and mountains and is very popular with climbers, walkers and sailors. The biggest stretch of water is Windermere. In 2007, television viewers voted Wastwater as Britain’s favourite view.